Number of Asian billionaires soars to 234 from 130 last year. 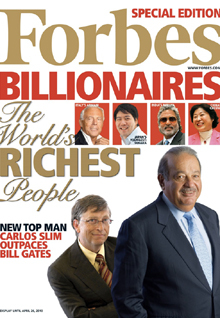 Singapore, March 11, 2010 — Asia has staged a strong showing in the latest Forbes World’s Billionaires list released today. The number of tycoons from the Asia-Pacific region with a ten-figure net worth has risen to 234 from 130 last year. This accounts for 23% of the 1,011 billionaires on the global list against 16% the year before. The combined wealth of Asian billionaires has also more than doubled to US$729 billion compared with $357 billion a year ago. This rate of increase far outpaces that of European tycoons who saw their collective fortune rise by 50% while their US counterparts enjoyed only an 18% increase. Of the 234 Asian tycoons on the list, 62 are first-time billionaires out of a total of 97 new billionaires in the world. This is a nine-fold increase from last year when Asia supplied only seven newcomers to the list of 38 new billionaires. China accounts for the lion’s share of Asia’s first-time billionaires, supplying 27 new faces, followed by India with 11, Taiwan with 10, Hong Kong and Japan with three each, Australia, Indonesia and South Korea with two each, and Malaysia and Pakistan with one each. This is the first time Pakistan is represented on the billionaires list. With a net worth of $1 billion, Mian Muhammad Mansha is the owner of Nishal Group, Pakistan’s largest exporter of cotton clothes and the nation’s largest private employer. The richest man in Asia-Pacific and fourth in the world rankings is Mukesh Ambani, head of Reliance Industries. Ranked seventh globally last year, the Indian national is valued at $29 billion, up almost 50% from $19.5 billion in 2009. Following closely behind is Lakshmi Mittal, chairman and CEO of ArcelorMittal. He is ranked fifth in the world, up from No. 8 last year. Mittal is worth $28.7 billion, up nearly 50% from $19.3 billion previously. The third richest in Asia-Pacific and No. 14 in the global rankings is Li Ka-shing. With the two Indian tycoons, he rounds off the Asian representation in the top 20. The octogenarian is head of Cheung Kong Holdings and Hutchison Whampoa. Ranked No. 16 globally last year, Li has a net worth of $21 billion, up from $16.2 billion in 2009. These three tycoons were also the top three richest Asians in last year’s list. Also noteworthy is the richest man in China, beverage baron Zong Qinghou of Wahaha Group. He is ranked No. 103 on the global list compared with No. 376 previously. Zong is worth $7 billion, compared with $1.9 billion last year. The richest Asian woman is Savitri Jindal from India. Jindal is worth $12.2 billion and is ranked No. 44 globally. Last year, she was worth $2.7 billion and was ranked No. 234 globally. She controls the steel and power conglomerate O.P. Jindal Group. Claiming the top spot this year on the Forbes World’s Billionaires list is Mexican telecom titan Carlos Slim Helu and family. They are worth $53.5 billion, up by more than 50% compared with last year’s $35 billion. Helu was ranked third last year. Losing the pole position is Bill Gates who is ranked No. 2 this year. The Microsoft founder is worth $53 billion, $13 billion more than last year. Slipping to third position from second last year is legendary investor Warren Buffet. He is worth $47 billion, an increase of $10 billion over his net worth in 2009. The biggest gainer this year is Brazil’s iron ore magnate Eike Batista who scaled the ranks from No. 61 last year to be the eighth richest man in the world. His net worth is $27 billion, more than 2.5 times his wealth in 2009. There are 89 women on the list this year, up from last year’s 72. The richest woman in the world is Christy Walton & family of Walmart. Their net worth is $22.5 billion, up from last year’s $17.6 billion. Walton maintained her rank at No. 12. The youngest billionaire is Mark Zuckerberg, founder of Facebook from United States. The 25-year old is worth $4 billion and is ranked No. 212. The oldest on the list is Swiss software tycoon Walter Haefer. The 99-year old is valued at $3.3 billion, up from $2.7 billion last year. Haefer slipped the ranks from No. 234 in 2009 to No. 287 this year. This year, the average net worth per billionaire is $3.5 billion, up slightly from last year’s $3 billion. The world now has 1,011 billionaires compared with 793 in 2009. More on the Forbes World’s Billionaires can be found in the March 29 issue of Forbes, which will be available on newsstands next week. Forbes estimates of net worth are deliberately conservative. Included in the tally are stakes in publicly traded and privately held companies, real estate holdings, investments in art, gems, yachts and planes, plus hoards of cash. Forbes takes a hard look at debt. Privately held companies are valued by coupling estimates of revenues or profits to prevailing price/revenues or price/earnings ratios for similar public companies. The estimates are a snapshot of wealth on February 12. For more information, visit www.forbes.com/billionaires.